Humble Juice Co.’s HMBL Salts E Liquid line has a fan-favorite inclusion of the classic tropical fruit combo in their Strawberry Kiwi features salt nic. The combination of sweetness of these two beloved fruits is as old as peanut butter and jelly, but much tastier if you ask us! While sweet favor is at the forefront of this tropical fruit combo, a slight tartness component of the strawberry rounds it out and sets the balance bar for every vapor’s daily needs. If you prefer fruit-flavored gum over mint, or your eyes light up when you see strawberries included atop your favorite dessert, then you will share the same love for this plentiful berry flavor present in this HMBL Salts E Liquid. The strawberry immediately sends happiness signals to your taste buds and endorphins while the sweet kiwi slowly creeps in to complement this sweet n’ tart fruit favorite. You inhale and transcend to a tropical island on a white sand beach with the tastiest of tropical drinks in your hand. Only, you have your favorite vaping device filled with this exquisite liquid and you are relaxing at home or grinding away at work. Who says you can’t bring the tropics to you? We, at Breazy, and Humble Juice Co. certainly think you can have delivered your paradise through misty vape excellence. Once you inhale and are immediately pleased by the tannins present from the fruit combo you know and love, the nicotine salts deliver just the right amount of joy to your brain’s receptors while not being too harsh on your throat or lungs. 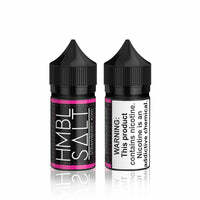 That’s the beauty of the nicotine salt delivery method and Humble Juice Co has taken full advantage of this new-age form of nicotine delivery through their HMBL Salts line. Hurry and order a bottle of the fruit combo you’ve always loved but never had so readily-available through HMBL Salt’s Strawberry Kiwi Salt E Liquid.